On my way to someone’s desk at work I overhead a blunt and emotive statement “Agile doesn’t work”. I smiled slightly and hung back to overhear the conversation further. I learnt through listening that the person making the statement was a Product Owner. They were unhappy with the fact that their team hadn’t been delivering on their product backlog, that they team instead had gone off and begun to work on something else. I was a little shocked to hear this, and could deeply empathise with the concern. If it was the case then the team was indeed not performing to expectations. 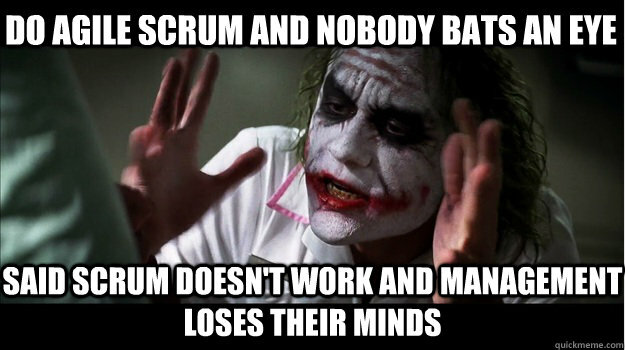 I spoke to the Scrum Master later about it (note they were not a team that I had direct coaching involvement with) and learned that team had actually begun working on something else because it had been a directive that had come down from several layers above the Product Owner. … and people wonder why Agile gets a bad rap. Some would also say that the fact that the Product Owner’s management trumped his work is an indication of concern, that he may not be empowered to calls the shots. Normally I would suspect such a problem, but in this instance this was an urgent unplanned change that impacted hundreds of people and dozens of teams, it was highly irregular. I asked the Scrum Master if they would be willing to talk further through the above problems with the Product Owner in order to reach a common understanding of where the problems with Agile in the team were. Agile does work. It, just like any process, needs people to understand the process and follow the steps to enable it to succeed. Just a good, simple and to the point article, and as you say “people wonder why Agile gets a bad rap”. Thanks. Agile doesn’t work. People work. Or they don’t, as the case may be. Saying ” doesn’t work” is a shorthand for saying “We used , and the results didn’t work”. Thus, before saying ” doesn’t work”, it’s necessary to establish if was used, and used appropriately. Product Owners not communicating with their product team on a regular basis is certainly a sign that Scrum wasn’t being used correctly. But still – this by itself isn’t a sign of process failure. The real question is: what did they learn from this? Did they start talking more? ← Reform Options for a new Australia?